Contributed by Author Desmond P. Ryan. In our last instalment of Cabbagetown resident Desmond P. Ryan’s 10-33 Assist PC, fictional Detective Constable Mike O’Shea–a cop with a knack for working hard and following hunches–and his team were on the verge of cracking a major human trafficking ring when a cop from another team burned his cover. It seemed that the year-long investigation had been destroyed and the girls had been stolen away again. Moments later, a poorly executed murder attempt on Mike’s life provides some much-needed intel about a man with a Glasgow smile and the girls he is holding, driving the investigation back into focus. And Chelsea Hendricks, the girl who sparked the investigation and was previously believed to be dead, is alive! Wowza! How can you leave the story here, you ask? Well, you’ll have to join us again in the next issue of Parliament Street News to find out what happens to Detective Constable Mike O’Shea and his team. 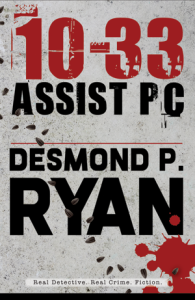 Or, if you absolutely cannot wait, pick up a copy of 10-33 Assist PC on Amazon or Kobo (physical and ebook copies available).